The infamous Boba Fett. Perhaps it is this character's god-like status that makes this such a desirable figure. 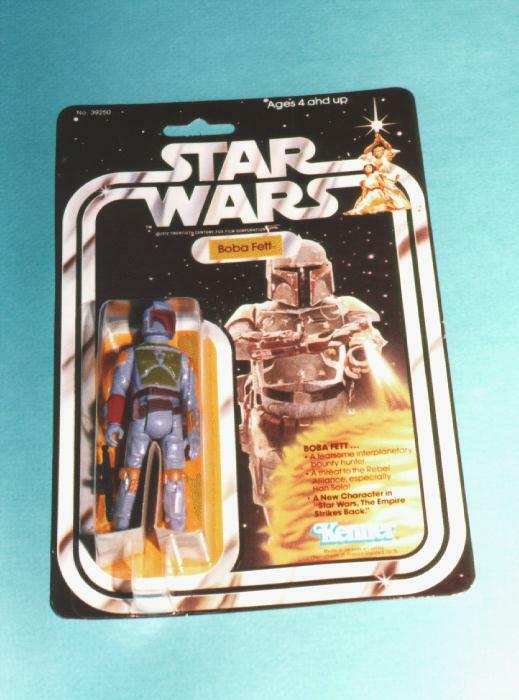 Boba Fett was the first figure ever offered as a mail in by Kenner (we'll leave the rocket-firing backpack story to another time). This was the last of the SW logo figures to be released, but as we all know and as the card itself states, Boba Fett was a character from The Empire Strikes Back. Although the ESB version has the same photo, the text in the fireball is missing appropriately. This figure has quickly risen to become one of the highest priced and sought-after carded figures in the past couple of years.